~ A SPECIAL NOTE TO YOU! Merry Christmas and Seasons Greetings to all our friends and loyal readers! We have enjoyed hearing your comments and trying to find unique and helpful apps that stand out in the App Store. Enjoy a safe, healthy and happy holiday! 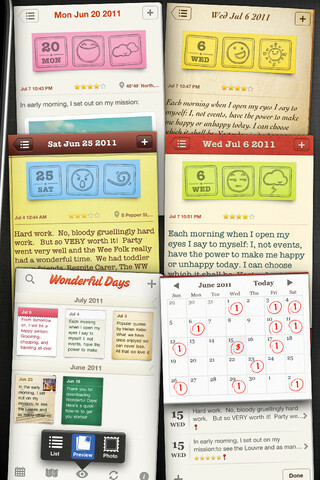 Developer Quote: "Wonderful Days is an ideal app for diary, journal, and note-taking. 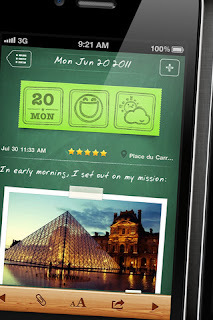 It is polished with a lot of customization options, including themes, photo frames, fonts, and icons. " - Write multiple diary entries in one day. - Sync content seamlessly with Evernote across multiple devices. - Insert photos anywhere in the text. - Choose from over 20 lovely hand-crafted weather and mood icons. - Geo-tag your entries and browse them on the map. - Decorate your entries with a collection of beautiful themes with diverse styles. - Add various kinds of frames to your photos. - 12 fonts to choose from, including 4 custom fonts that are not in the OS. - Make your diary unique and stylish with different combinations of themes, frames, and fonts. - Three modes of viewing entries: List, Preview, and Photo. - Calendars for selecting dates and browsing entries. - Easily email your entries, export them as PDFs, or print them out with AirPrint. - Rate entries from zero to five stars. There are so many unique ways in which you can enjoy this daily journal. You may insert photos, geo-tag your entries, use various themes and fonts, add weather and mood icons, all of which apply to the day's entry as it fits. What you are creating is a book that is both beautiful and well organized with all the moments you want to hold near and dear. Whether you are using this journal for business or personal reasons, you can't ignore the value of viewing entries in 3 different modes, having functional and important calendars at your fingertips using keywords to find the exact entry you need. COOL CONCLUSION: "Wonderful Days - Diary With Style is a pratical, beneficial and excellent tool to document your life depending on your needs, be they personal or business."